The greedy hand : how taxes drive Americans crazy and what to do about it · One Book. One Author. One Hour. Notes on front endpapers: Earned Income Credit, H and R Block. Beardsley Ruml, Adam Smith, Milton Freidman, Thomas Paine, James Buchanan--Public Choice Theory, John Kenneth Galbraith, Betty Freidan, Harry Hopkins-182, F. Hayek, Tocqueville, Cato, Heritage T. At the Journal. Leona Helmsley, George Harrison, Mary Barrosse p 128. 1913--Income tax loan, Current Tax Payment Act of '43. Tax Freedom Day May 10, $40 meal-$11 in taxes. Tax code 1.3 million words, Tax code 1.3 million words. Tax code regulations 5.75 million words. Tax code regulation 5.75 million words. 80,000 lobbyists. Bob Bartley's silence p 234. “How to get around the politics” p 226. Social Security Act passed. House 372-33 1935, Senate 77-6. Marriage penalty--p 25. 21 million pay $1,400. Progressivity p 175. Republicans as responsible 16th Amendment. Alternative minimum tax. Success tax. Lamb checked each book section on the Contents page. Notes and underlinings focus on the history of American taxation, economists, social security. Spending, taxes, Ponzi schemes, FICA, deficits. The book explores all aspects of taxes, impact on schools, marriage, daycare, senior citizens, etc. 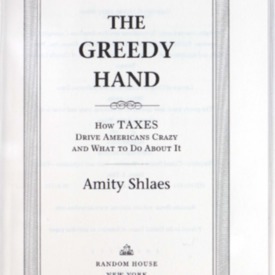 Shlaes, Amity, “The greedy hand : how taxes drive Americans crazy and what to do about it,” One Book. One Author. One Hour., accessed April 24, 2019, http://booknotes.gmu.edu/items/show/427. A look into the taxes we pay, what they are for and how to change the laws effectively for our benefit.